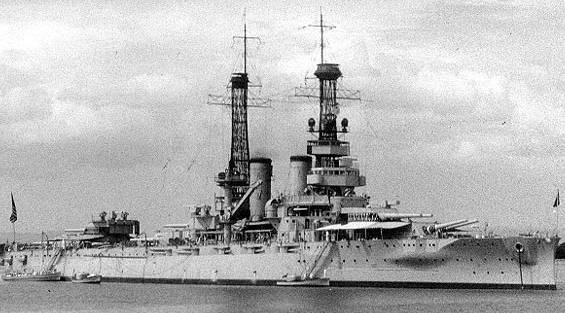 USS ARKANSAS in the 1920's. US Navy Photo from the Navy History and Heritage Command On-Line Library. document contained not only listings of the commissioned and warrant officers of the service, but also organizational tables for forces both ashore and afloat. Using it, as well as other resources, I compiled the following pages. some senior officers still saw Britain as a potential foe, most assumed any future naval conflict would entail battle with the forces of Imperial Japan. Dominican Republic, and the Navy administered various Pacific outposts. for the most part the Navy possessed only a handful of old scout cruisers mainly used as flagships for detached units. The Navy Directory also included a "War"
not be commissioned for years. USS OMAHA as built, circa 1923. US Navy Photo from the NAVSOURCE photo archive.